Ember days are four separate sets of three days within the same week — specifically, the Wednesday, Friday, and Saturday — roughly equidistant in the circuit of the year, that are formerly set aside for fasting and prayer. These four sets of Ember-Weeks are the fasts of the four seasons. The Ember-days (so called from the custom of our forefathers: fasting on those days in sackcloth and ashes, or from their eating nothing but cakes baked under the embers) are Wednesday, Friday, and Saturday of the first Week of Lent, of Whitsun-Week (Pentecost-Week), of the third Week in September (after the Exaltation of the Holy Cross – September 14), and of the third Week in Advent (after the feast of St. Lucy – December 13). 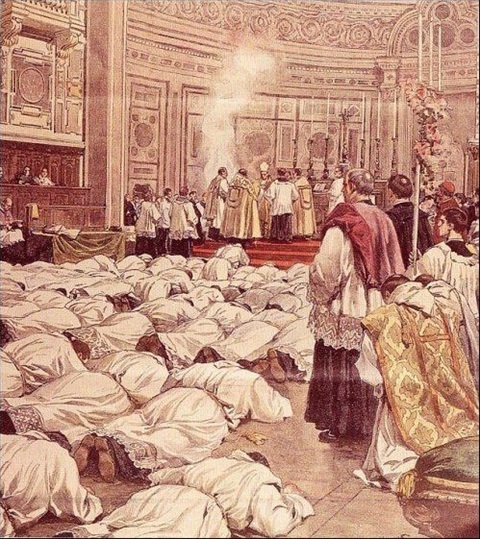 The spirit of the Church is to engage her children, at these stated times, to pray, fast, and perform such other good works, as may prevail with God to furnish his Church with good Pastors; Saturday in Ember-Week being the appointed day for ordaining and consecrating persons to the Sacred Ministry. We are likewise to beg God’s blessing on the fruits of the earth, and give him thanks for those we have already received. Ember Wednesday - Fasting & Partial Abstinence. Ember Friday - Fasting & Complete Abstinence. Ember Saturday - Fasting & Partial Abstinence. Also read: Church law on Fasting & Abstinence.